Jan 27 What happened to Nelson Reed and Daniel Scott when they went to Nigeria? 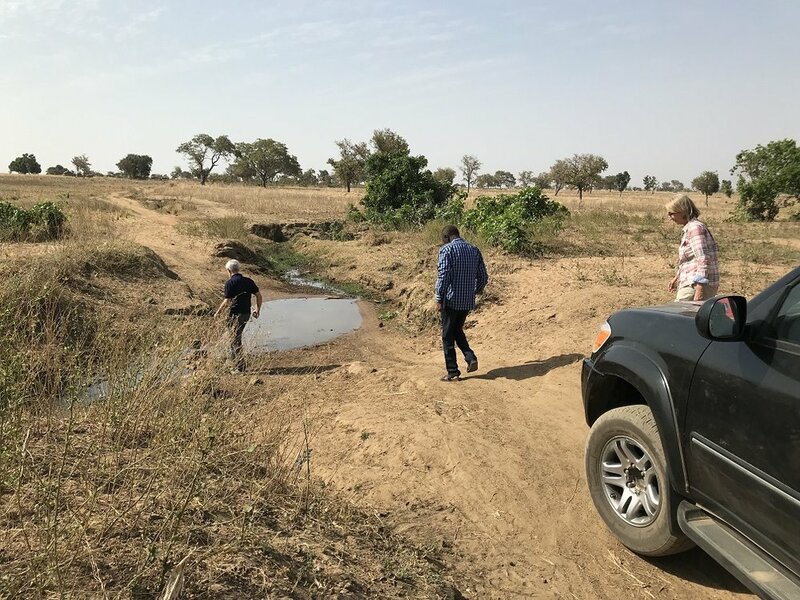 Nelson Reed and Danny Scott, representatives of Action International Ministries, in Nigeria for a ten-day tour of the work of Schools for Africa, started out a little roughly in the Port Harcourt airport. Danny was confronted at the Health desk for not having had a yellow fever shot, even though he explained he couldn’t have the shot for medical reasons. Some of us cannot safely have the yellow fever immunization, he explained, to no avail. The health officer first asked Danny for $90, then dropped it down to $50. Danny asked for the written regulations governing this situation, but they were not available! Then I showed up, (a kind security officer allowed me into the arrivals hall,) and told the man that I worked in Nigeria, Danny was my visitor, and that please, he should allow him in. The man dropped Danny’s passport on the desk, I quickly snatched it up and we were allowed to go through to Immigration! I only have one picture of Nelson and Danny in the arrivals’ hall; it looks steamy, as though we were in a sauna, but actually it was vaporized, cold air from the large, standing air conditioner in the room! Our first stop in Port Harcourt was the Mogodi Camp School, a small school with three classes located in an abandoned building in an area of abandoned buildings where Alhaji Mogodi’s people and many other Fulani families have taken up (informal) residence. The Head Teacher is requesting that we buy land in the town and build a proper school, but I won’t do that. We need to stay right in the heart of the Fulani’s settlement to ensure that the children will continue to attend school. We have three teachers at this school, all doing a terrific job; Mogodi reports that the community is most satisfied with their performance. Of course, we spent most of the two days with Mogodi and other members of his extended family talking over issues important to the herdsmen living in this area. One of the discussions took place with many of us, thirty or more, sitting under trees and others under the large, open, ‘men’s hut’ nearby. Instead of focusing on the challenges of which we are all aware - clashes with farmers, no grazing land, feelings of neglect and persecution as a people - Nelson turned the conversation to possible solutions! Clearly, the Fulani have the worst reputation world-wide. It’s all over the internet and in Nigeria, in all the newspapers. Please, please…do not believe this for a moment. Yes, it’s true, there are those ‘bad’ eggs among them as in every society, but for the most part politics are deeply involved as are terrorist groups who are using the Fulani, disguising themselves as Fulani, as a shield against their enemies. Nelson’s suggestion is that we gather stories of good things the Fulani are doing for their neighbors, for their country, such as, for example, supplying the country with meat and milk! If we can have good stories, positive ways in which the Fulani are contributing to the welfare of Nigeria, we’ll broadcast those all over internet and in the newspapers, and with God’s help, begin to change the public opinion of the Fulani. Another suggestion from Nelson was that Mogodi, a renowned ‘Man of Peace’, find a leader among the farmers/indigenous land owners who would also like to work towards peace, and form a coalition, an alliance which would work in the community, in the local and state governments, even the federal government, towards peace. We are going to look for an advocacy group that would help in this process. The peace discussions we had with the Port Harcourt Fulani were continued both in Abuja and in Bobi. Nelson and Danny had their first taste of authentic Nigerian fare in the home of Mogodi’s brother in law when we were served pounded rice, (kind of like sticky rice,) with melted butter, chunks of ram and beef swimming in broth and all washed down with fresh, raw, cow milk! I was pretty happy with our two visitors who ate with their fingers in the traditional way, and, happy there were no ensuing tummy problems, thank God! From Port Harcourt, we flew Air Peace to Abuja, Federal Capital of Nigeria. Lawal and one of his friends met us at the airport and drove us straight to the Ramat Hotel in New NyaNya, a town in Nasarawa State located near the church where Nelson and Danny would conduct a two-day training for the nearly forty Free Methodist pastors in the new, provisional Northern Conference in Nigeria. The teaching was from the Book of Titus, in which Paul instructs his young disciple Titus to strengthen the churches on the Island of Crete, to appoint qualified leaders, instruct the members on how to live God fearing lives day after day, teaching them, encouraging them and correcting them when necessary. Paul gave Titus a time-frame in which he was to do this work then he was to move on to Nicopolis, assisting others on Paul’s team with anything they needed. All of this teaching was most appropriate to what our new pastors are facing today and will face ‘tomorrow’. Many fruitful discussions took place under the trees of New NyaNya. Our last stop on this ten-day journey was to the Bobi Grazing Reserve in Niger State. We were many in the two vehicles: five in the pick-up and seven in the Sequoia! By God’s grace, the journey went very smoothly…..well….incident-wise at least! The road to Bobi is not, not, NOT smooth! It’s one of the worst roads I’ve traveled! Ask Danny…he had to sit in the middle, back seat of the Sequoia, stuck between Janet Ahiaba and me, bumping his head on the low roof over and over along the way! But, we got to Bobi safely….and were greeted so warmly by Alhaji Buba and his extended family that the inconveniences of the trip were soon forgotten. We were also greeted by Shane’s Boerbol, Bullet, and Okon, our cook! Okon had gone to Bobi early, to prepare our rooms and have food on the table when we arrived! The bedrooms were clean, our beds made up, towels and soap in the bathrooms….just like a swanky hotel! (Well, kinda…) A delicious casserole was served up, the generator came on right at dusk, we had lights and were able to charge our phones. God is in His Heaven; all’s well with the world. All was well until around 2 am when Alhaji Buba’s rooster began to crow, and did so at regular intervals until we finally hauled our tired bodies out of bed! Thank goodness for coffee….what would we do without it? The following day we began our visits around the neighborhood and to the schools on Bobi Reserve. First stop was Sariki Bello’s compound. Bello is one of the two kings on the reserve. We spent a little time greeting him, his old mother, and large, extended family. Next stop was to the palace of Alhaji Saidu in Kamfani Bobi town. Saidu is the overall chief of the Fulani in the area, on and off the reserve. This man is so welcoming, so genteel, so nice. Everyone loves him. You cannot step into his parlor without there being at least six other people sitting at his feet, telling him their problems, seeking his advice or just passing the time of day. I always stop and greet him before beginning my stay on Bobi. After Alhaji Saidu’s house, we visited the first school, imaginatively nicknamed Bobi 1! We visited each classroom, greeted the children and teachers, and continued on our way. From Bobi 1 we drove to Bobi 3, or ‘Big Dam Primary School’, preparing to visit classrooms there as well. But to our surprise, a very large group of Fulani men were waiting to speak with us, and so quickly, one classroom was vacated, (those children sent home early,) and we spent the next hour or so listening to their stories, telling our stories, sharing together on so many things. It was a wonderful time of fellowship with these Fulani parents, who greatly appreciate this school for their children and are committed to faithfully seeing them through primary school and beyond. After the meeting it was too late to visit classrooms, so we walked down to the dam and mingled with a herd of cows for a few minutes….oh, and their herdsmen too! The last school to visit was Bobi 2. There again, many Fulani parents were waiting for us led by their king, Sariki Ahijo. We got in quick visits to all the classrooms before clearing a room for this meeting, which was just as delightful as the first one. After the meeting we walked down to Dam Erga, the failed dam on the reserve, just to take a look. Big plans are underway to repair that dam. We were also taken to see one river, dry now, which children have to cross to go to school. The parents were thinking a culvert would solve the problem. But after questioning the local men we discovered that during rainy season the water is very high and wide, and no culvert would help. We were then assured that the children would somehow find another way around the river to get to school. I didn’t mention that Rev Jacob Ahiaba and his wife Janet accompanied us to Bobi on this trip. We had wonderful times of fellowship with them, around the dining table and outside in the cool of the evening. Nelson, who spent over twenty years as a missionary in the Philippines, had so much to offer to Rev Jacob who is just starting out in his new role as superintendent of the new Northern Conference. We discussed many things, one of which is the need for a Bible school here in the North. Nelson has so many good ideas about this, and is going to help us to acquire the best curriculum for our particular area and put us in touch with those in Nigeria who use this curriculum and can train trainers for us. So thankful for the deep interest and concern shown by Danny and Nelson in regards to how this new group of pastors can get the best foundation for this great, new work. On the evening of the second day on Bobi, we attended Bible study at the First Free Methodist Church, Bobi Grazing Reserve! The church has grown by leaps and bounds, with Rev John Raji and Pastor Yakubu reaching many new souls and discipling young men and women to go out and plant more churches. Rev John told us that people are coming from as far away as twenty to thirty kilometers, asking for pastors to be sent to their areas to teach them about God. We drove back to Abuja on Thursday, January 24, reaching the ECWA Guesthouse before dark. (ALL our visitors stay at ECWA! The manager, Pauline, cares for us so nicely!) Shortly after our arrival, Rev Jacob’s brother Yahaya Ahiaba came over bringing Nelson’s laptop, which he’d inadvertently left at the Port Harcourt Airport. With strong help from Mrs. Itoro Micah, (Director of the ICCM school in Port Harcourt,) who went to the airport, identified the laptop and verified its owner, it was handed over and shipped to Yahaya in Abuja via DHL, then returned to Nelson in perfect condition! So thankful for good friends like Yahaya, and Itoro who spent her entire day solving this problem for us! I thank God for friends in many cities all over Nigeria, and pray for their families, safety and ministries. So, friends, this is what happened to Nelson Reed and Danny Scott on their visit to Nigeria! And it was good! It was very, very good! Feb 26 We're making a film. Jan 5 Tempus Fugit! Time Flies!